AHLA Luncheon Series - Austin Hotel & Lodging Assoc. 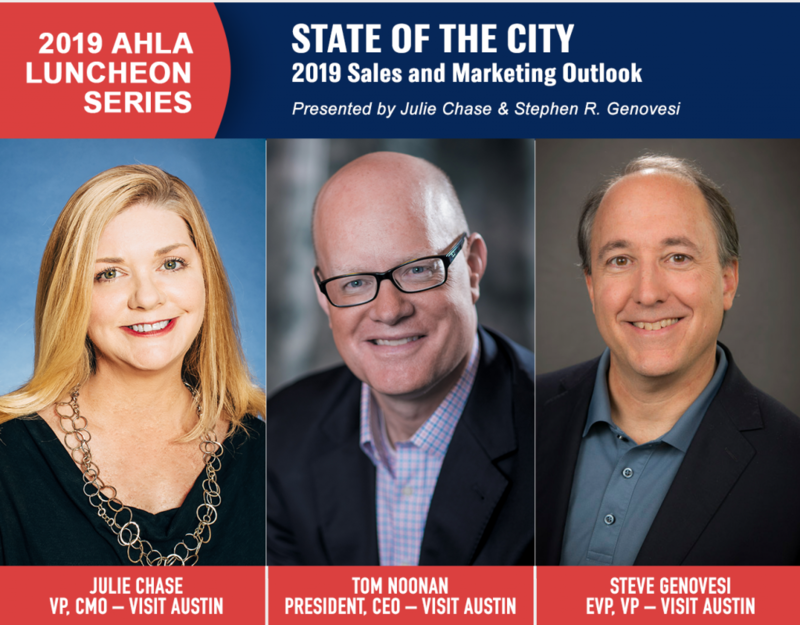 ALearn firsthand from the bureau how the Austin lodging and tourism industry has built a solid foundation, as presenters Tom Noonan, Julie Chase, and Steve Genovesi provide a Sales and Marketing Outlook for 2019. Tom Noonan joined Visit Austin in May of 2016 as President and CEO, moving from Maryland where he served as CEO at Visit Baltimore since 2007. Under Noonan’s leadership, Austin has seen year over year increases in total number of visitors, visitor spend and record convention bookings. The organization also successfully rebranded from the Austin Convention and Visitors Bureau, to the current Visit Austin. In 2017, Tom led the Austin hospitality industry in hosting a successful PCMA Convening Leaders. Additionally, Tom serves on several industry Boards, including U.S. Travel Association, Destinations International, ASAE and Texas Travel Industry Association. Tom is a graduate of Luther College in Decorah, Iowa where he studied business management and speech communications. Those disciplines have served him well in a destination marketing career that has progressed steadily within the DMO industry over the years. With a 30-year career in tourism, Tom spent 18 years at the Dallas Convention & Visitors Bureau where he started in Sales and Services and left as a Convention Marketing Executive when he accepted the role of CEO at Visit Baltimore. Steve Genovesi has 34 years of sales & marketing experience in the convention and tourism industry. As Executive Vice President, he has overall responsibilities for the convention, sports and conventions service departments. Steve has been with Visit Austin for almost 8 years. Prior to coming to Austin, Steve was VP of Sales and Marketing for the Chattanooga, Tennessee Convention and Visitors Bureau for 8 years nd Marriott Hotels for 18 years – which included Director of Sales and Marketing for the San Antonio Marriotts, Director of Sales at the Atlanta Marriott Marquis during the Summer Olympic Games and the Opening General Manager for the largest urban Residence Inn in downtown Philadelphia. Julie Chase is the Vice President and Chief Marketing Officer for Visit Austin where she joined in 2012 after serving as Tourism Director for the State of Texas since 2003. In her role, Julie oversees the bureau’s marketing, public relations, tourism, music, and film initiatives promoting Austin nationally and internationally as a destination. While at the bureau, Julie has helped make Austin a top destination generating record visitation, travel spending, and award-winning innovative marketing and travel partnerships. She also serves on the Austin Air Services Task Force, working with local business leaders to advance aviation transportation to the city. Prior to joining the state, she served as a Public Relations Representative for the Superconducting Super Collider Laboratory in Dallas, Texas. Julie is a graduate of Texas Tech University.